City of Peterborough Ladies are pictured before their win. From the left are, back, Simon Morris, Anna Faux, Rhianne Saunders, Robyn Gribble, Lauren Finding, Jen Duffy, Katy Lee, Emilie Morris, front, Tierney Augustine, Georgina Wilkinson, Jess Amps, Emma Faux, Kirsten Hackett, Amy Ellington, Chelsea Oldham and keeper Charlie Exton. Bourne Deeping are confident thay can make life tough for City of Peterborough when they clash in the first round of the English Hockey Cup at Bretton Gate on Sunday (2.30pm push back). 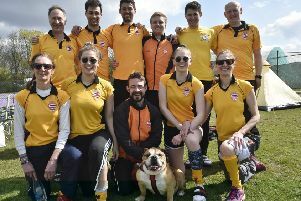 Bourne Deeping play their league hockey two divisions below East Premier A Division side City, but captain Richard Collins expects his experienced side to give a good account of themselves. Collins said: “City are obviously a great team playing at the highest level, but they have signed several new players who hopefully will still be learning to play with each other. “If we get our strongest team out we will have lots of experience. Half the team have National League experience, but they will be 10 years older than City’s players! Bourne Deeping certainly started their Division One season in style with a 9-4 win over Pelicans as Shane Carlton, Stuart Biggs and Simon Thomas each scored twice. City lost their opening top-flight game 1-0 at Old Loughtonians, but they were very unlucky. Goalkeeper Cameron Goodey was stuck in traffic on the M11 and never made the match so City started with Joe Finding playing as a kicking back before defender Paul Hillson took over as a stand-in keeper. Hillsdon was beaten just once by a short corner just before half-time. City are hoping for better fortune this weekend when hosting Dereham in a league match on Saturday (1pm) before entertaining Deeping. Aussie import Robbie Muir is expected to make his debut and give City some much-needed attacking firepower. City skipper Ross Booth said: “With the addition of Muir to the squad, there is now an added depth and competition within the side that has been lacking in previous years. “We hope that this lifts everyone to maintain their strong home form and pick up a first win of the season on Saturday. Newly-promoted City of Peterborough Ladies opened their East Division One campaign with a 3-2 win over Norwich Dragons. Tierney Augustine, Georgina Wilkinson and recent signing Robyn Gribble scored the City goals. City travel to Cambridge City seconds this Saturday. Spalding came up as champions with City, but they lost their opening fixture 1-0 at home to Cambridge last weekend. Spalding men won their first-ever match at Premier B level. They thumped Cambridge Univresity seconds 5-1 with Connor Allen scoring twice.